Profoto Lamp Head including Profoto Zoom Reflector. 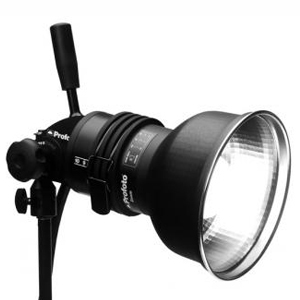 This is the Profoto Pro Flash Head. It is compatible with Pro-8a Air, Pro-7a, Pro-7s, Pro-7b, Pro-B3 AirS, Pro-B2, and D4 Generators. It features a circular, heavy duty quartz flash tube which surrounds the modeling lamp. It provides even illumination and maximum light output. It accepts the complete Profoto system of modular light shaping tools. In the studio or on location, the standard heavy-duty tool is the Profoto ProHead, built for producing flashes up to 4800 Ws, over and over again, hour after hour. The head has a thermostatically controlled 2 speed fan for efficient cooling.